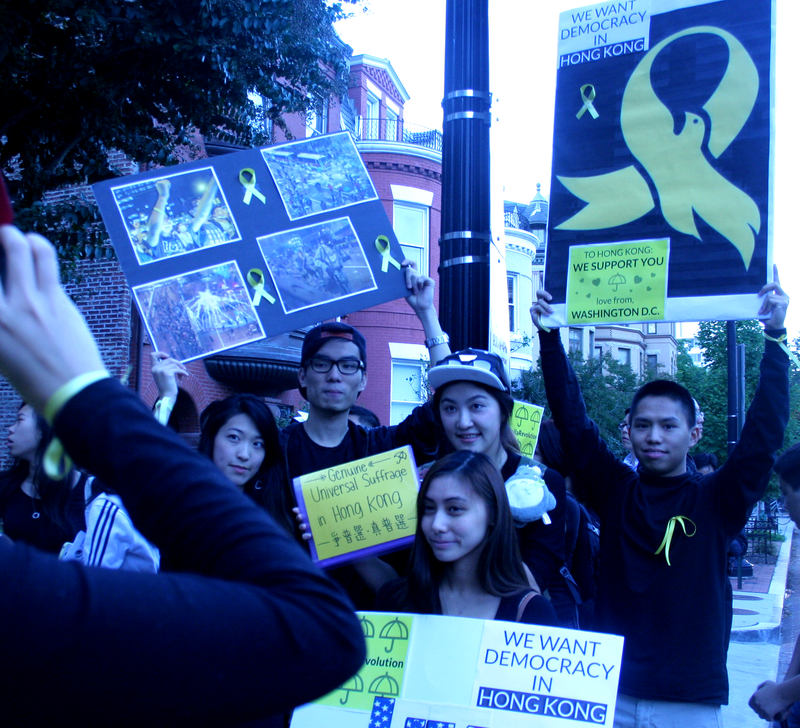 WASHINGTON—More than 150 people supported the Hong Kong democracy protesters in DC on China’s national day. They gathered outside the Hong Kong Economic and Trade Office, called the Office for short. Because Oct. 1 was a national holiday in China, the Office was closed. The Office is near DuPont Circle, home of embassies and think tanks. Most were young and students. Many carried umbrellas, which has become the symbol of the protest in Hong Kong because umbrellas were used to protect students from rain, or from the tear gas and pepper spray police used last week. At the Office, they signed a poster that said, “Stay Strong, Hong Kong!” and put on yellow ribbons in support of the students. They sang two songs that are sung often in Hong Kong. One’s title, roughly translated means Golden Age, and is based on the ideals of humanity expressed by Nelson Mandela. The other song’s title is about the wide expanse of the ocean and sky. Basically, both express a longing for freedom. Most everyone was wearing black. Tin-ng Chin, who originally came from Hong Kong when he was in high school and is now a permanent U.S. resident, said, “We want to show unity and solidarity for the people of Hong Kong.” Chin noted that in Chinese opera, black connotes righteousness, and said he thought that could be a reason for the choice of black. But he stressed that to show “unity” was the main reason. While Chin is relatively safe here in the United States, the same can’t be said about Yi Gu. Gu is a graduate student at the University of Georgia. He left Athens, Ga., the evening before and took a 12-hour bus ride to Washington. His home in China is in a small town near Chengdu, Sichuan Province, in southwest China. It was evident that these student protesters saw the Hong Kong desire for democracy and freedom and for open elections of Hong Kong’s city leader and legislature as applicable to the mainland, which many of them call home. David Chen is an undergraduate at Georgetown University who hopes to go to law school in the United States. Chen is from Guangzhou, which is not far from Hong Kong. Rallies on Oct. 1 and last week took place across the country: Boston, Chicago, Philadelphia, Ann Arbor, Mich., New York, Houston, Seattle, San Francisco, Los Angeles, Austin, Texas, and Berkeley, Calif., according to United for Democracy and media reports.